Home | News | Horizontal peeler vs. vertical peeler – which type to select? Horizontal peeler vs. vertical peeler – which type to select? Horizontal and vertical peeler centrifuges are the most versatile and reliable machines if it is about mechanical separation processes. The task for one or the other machine type is the same – but there are important parameters that have an impact on the decision for either the vertical or the horizontal peeler centrifuge. Important criteria for the selection of a horizontal or a vertical peeler centrifuge can be divided into three categories: installation, process, economy. Talking about the installation it is important to know whether it will be a brand new installation or a replacement of existing equipment. If just a replacement is planned, normally the process connections (feed pipe, wash pipe, filtrate pipe as well as the solids discharge mechanism) can be kept more or less “as is”. If a change of machine type from vertical to horizontal or vice versa shall be done, all connections to and from the machine need to be modified and replaced as well. This will have an impact on the project costs for both engineering and installation. All process connections for the vertical peeler centrifuge are installed on the top cover, whereas the process connections for the horizontal peeler centrifuge are located at the front door. Due to the top cover opening, the vertical peeler centrifuge requires a larger room height, the horizontal peeler centrifuge has a larger foot print. The installation costs for the horizontal peeler centrifuge are lower in terms of solids discharge, because the solids discharge can be done on the same floor level as where the machine is installed. The bottom discharge of the vertical centrifuge is mainly effected at the level below the machine. Demanding products, such as slow or fast filtrating slurries, normally can be better handled in a horizontal peeler centrifuge. The feeding process can be controlled better, unbalances can be avoided. A disintegration of the slurry in a horizontal axis centrifuge is not possible, because the filter cake is built up over the entire basket height. In a vertical centrifuge a gravitative disintegration of the solids can take place, the larger particles are settled near the bottom of the basket. This ends up in an uneven cake build-up, which leads to unbalances and poor washing results. This negative effect can be avoided by using special feed pipes, e.g. like a rotating feed cone. Both types of centrifuges do have different solids discharges. the vertical peeler centrifuge discharges at a central outlet below the machine structure while either a discharge chute or a discharge screw conveyor can affect the discharge of horizontal peeler centrifuges. 80 to 90 percent of chemical applications are realized with screw conveyors due to sticky products. Due to the large discharge outlet of the vertical peeler centrifuges those machine are mainly installed above bunkers or large receiving vessels. Another criteria for the selection is the different operation of the machines. The vertical peeler centrifuge must be fed at low basket speeds in order to obtain an even cake. Washing takes place at medium basket speeds, normally at about 50 percent of the maximum basket speed. After spinning at maximum speed, the basket speed needs to be decelerated down to a low speed for discharge. This way of discharge is best for products where crystal breakage needs to be avoided. But, the batch cycle is rather time consuming. After discharge, a heel removal step can be done in order to improve the filtration of the next batch. Normally, the heel removal is done by blowing high pressure air or nitrogen from outside the basket through the holes. For special applications the heel removal can also be done from inside the basket by nozzles that are installed behind the peeler blade. All the process steps (feeding, washing, discharge) in a horizontal peeler centrifuge can be done at maximum basket speed. This reduces dead process times for acceleration and deceleration and increases the performance. By using modern VFD drives, the batch cycle of the horizontal peeler centrifuge can easily be adjusted to the product characteristics. horizontal peeler centrifuges can also reach 20-30% higher maximum basket speeds compared to vertical peeler centrifuges. This results in lower LODs. Due to the higher rotating masses and the orientation of the horizontal axis, the entire mechanical design as well as the support structure needs to be stronger compared to vertical axis machines. The suspension plate of a 1600 mm horizontal peeler weighs approx. 20,000 kg, the machine only has a weight of approx. 10,000 kg. The total weight of a comparable vertical peeler centrifuge is only 13,000 kg. Behavior during feeding, the filtration effect, does tend to create unbalances or the wash efficiency are characteristics that have an impact on the selection of the type of centrifuge. Nowadays, cleaning of the process housing and the installations in the process housing are becoming more and more important. CIP (cleaning-in-place) and flooding of the housing are standard for both horizontal and vertical centrifuges. If the process step “Flooding function” is selected, with a horizontal peeler centrifuge the housing is filled up with cleaning liquid up to the level that wets the basket and the filter element. With a vertical peeler centrifuge this flooding level is just below the rim of the bearing housing. With this type of vertical machine, the area under the basket hub is cleaned with spray nozzles. 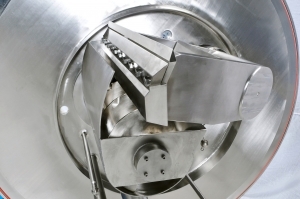 As the cleaning liquid is feed, the basket rotates at low speed. This ensures an intensive cleaning effect of both the filter cloth and basket. After “flooding” is finished, the cleaning liquid is drained through the filtrate discharge. It needs to be decided, whether the cleaning liquid is collected in the filtrate tank or whether it is discharged into a separate receiver. For this operation it also needs to be decided whether a diverter valve is installed at the solids discharge. This diverter valve avoids contamination of any type of coupled dryer with cleaning liquid. Last but not least costs have an important impact on selecting the right type of centrifuge. Several criteria need to be considered. The value of the product per kg is important: if this value is low, the cheapest way of dewatering possibly is the best choice, even if it does not show the optimum performance. Vice versa it may make sense to invest in the more expensive machine in order to obtain the best possible performance and results with regard to purity and LOD. The lower the LOD the lower are the costs of the thermal drying step after the centrifuge. Another cost impact is the material of construction. If the machine needs to be highly corrosion resistant, special materials like Hastelloy may become necessary. These materials increase the price of the machine, which may influence the selection of the machine type. Finally, the maintenance costs as well as the life-cycle-costs need to be considered. It can be that the investment costs and the installation costs of a Horizontal peeler centrifuge are higher compared to the vertical peeler centrifuge, but the performance and the lower overall maintenance costs may be advantageous over the vertical machine. The question for the end user and the application as to which centrifuge type to select can only be answered by considering some important criteria. Besides installation, process and design also the cost-value ratio is important. Before taking the decision for the selection of the centrifuge the “Pro´s and Con´s” need to be carefully balanced. Then it can be decided which investment makes the most sense for the particular separation process. For the selection process it may be wise to consult an expert. 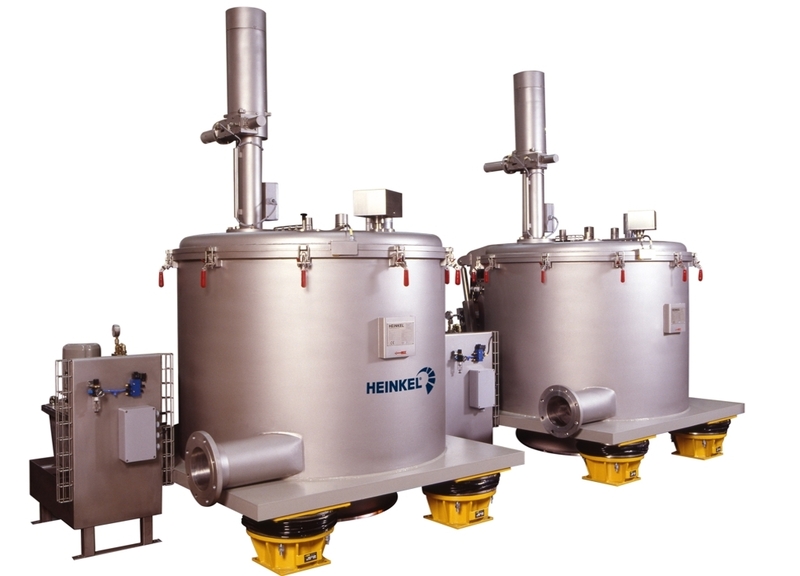 HEINKEL Drying and Separation Group with its experience over decades in solid-liquid-separation in the pharma, chemical and food industry can support customers with high valuable know-how. https://www.heinkel.com/wp-content/uploads/2018/07/V1250BC.jpg 741 1030 Matteo Battista /wp-content/themes/heinkel-child/img/logo-SVG.svg Matteo Battista2018-04-24 12:54:052018-07-17 12:58:57Horizontal peeler vs. vertical peeler – which type to select?